Wow, this dish really packs a punch! A very interesting recipe concept, plus quite a unique list of ingredients, this chili is amazing in flavor, heartiness, and originality. What makes this even better is its ease; throw all ingredients in a pot, bring to a boil, and simmer for 1.5 to 2 hours. 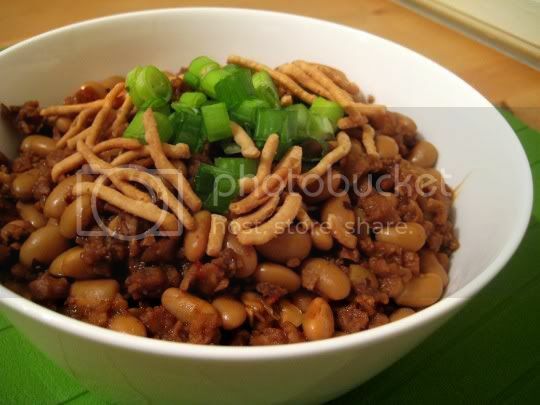 White soybeans, soy ground beef, and water chestnuts are cooked in a vegetable broth, and flavored with fresh ginger, garlic, Chinese black bean sauce, and Chinese chili garlic sauce. This dish screams Asian inspiration: the crunchy water chestnuts, the aromatic ginger, the pungent garlic. But what really flavors it is the black bean sauce: salty, savory, garlicky, with just a hint of sweetness. In fact, I would go so far as to say this stuff is bordering on TOO salty, so you definitely won't need any additional seasoning. A little splash of rice wine vinegar may even cut some of that saltiness back. The "chili" in the chili garlic sauce isn't really tasted (or felt) after cooking for so long, but the "garlic" is definitely still a prominent flavor. Green onions and chow mein noodles (those crunchy things) serve as garnish, but also add some fun texture and bite. Make again? Yes, super easy and super flavorful...and surprisingly hearty for an Asian-inspired dish.